The Earl and Countess of Strathearn attended Sunday service at the Balmoral estate this morning. The Duchess looked relaxed and happy. Rather than opt for a chauffeur, Prince William drove Kate to the church himself. There was no sign of two-month-old Prince George, however it is the first time the Duchess has been spotted in public this week. The trio arrived in Balmoral one week ago and are enjoying a low-key break in the Scottish highlands, taking the opportunity to spend time with relatives. 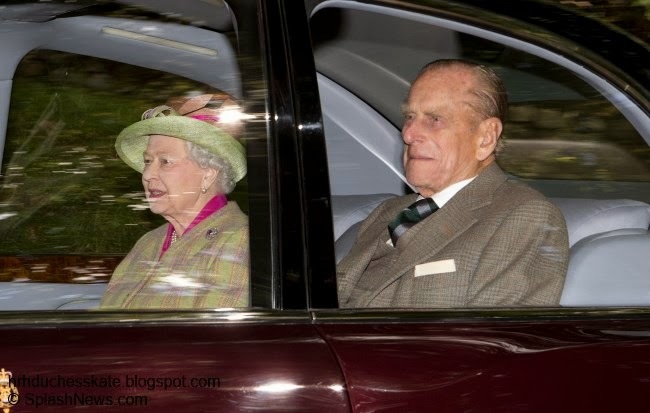 The Queen and Prince Philip were chauffeured to the church service while Prince Charles was also in the driving seat taking the Duchess of Cornwall, who was seen smiling from the passenger seat. All three royal ladies elected to wear tartan prints. Crathie Kirk is a small Church of Scotland parish church in the village of Crathie. It is known as a regular place of worship for the British Royal Family when they are staying in nearby Balmoral. The Princess Royal married her second husband, Timothy Laurence, at the church, because she was divorced and, at the time, not permitted to marry in the Church of England. It has been a relaxing break for the family. 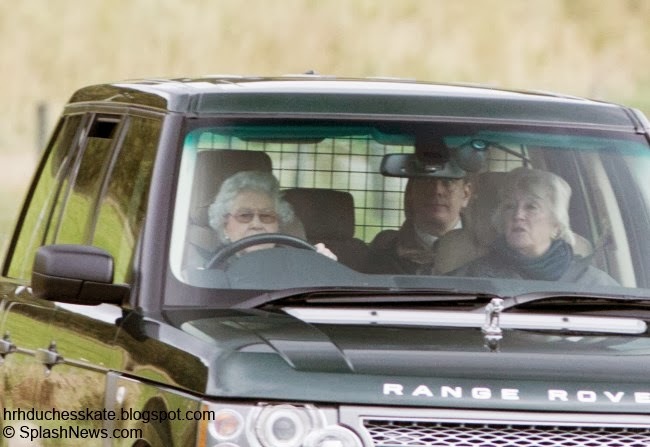 Last week, the Queen was photographed driving a range rover away from a grouse shoot at Balmoral. Her Majesty is a keen driver following her time as a driver and mechanic in the Women's Auxiliary Territorial Service during the Second World War. Interestingly, she is the only person in the United Kingdom permitted to drive without a licence. 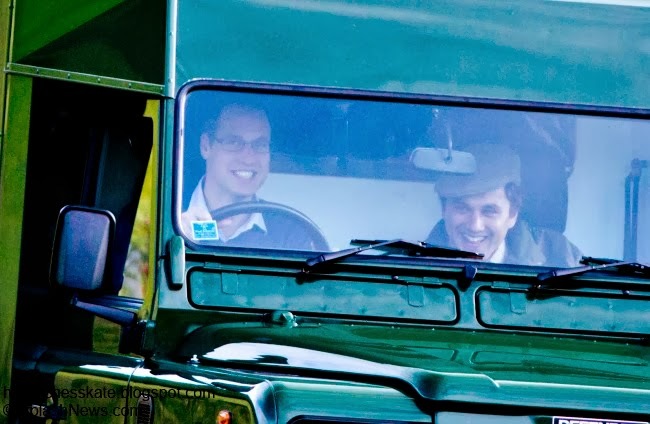 Prince William was also photographed leaving the shoot, accompanied by his close friend Thomas van Straubenzee. 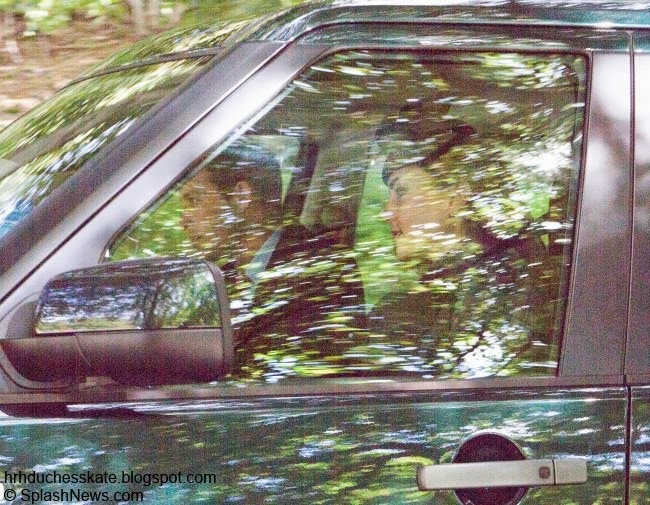 Kate was photographed sitting in the passenger seat of another vehicle. 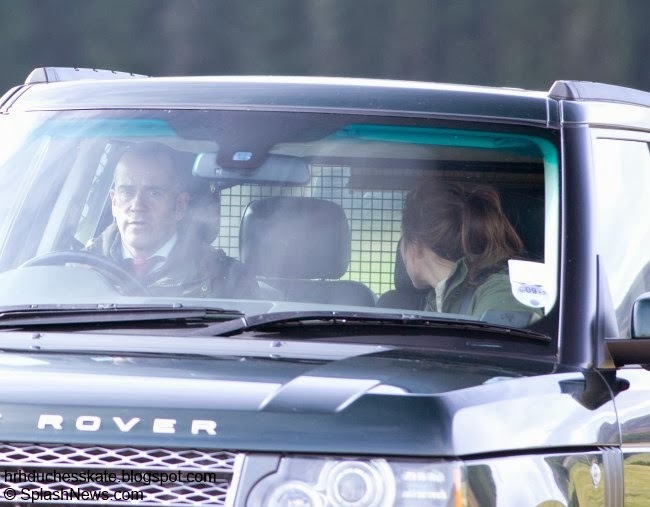 We cannot see the Duchess's face in the pictures, it looks like she's talking to the passenger in the back, possibly Lady Melissa Percy, Thomas van Straubenzee's wife. It appears a protection officer was driving. Back to today's service, the Duchess wore familiar pieces beginning with her 'Workers Coat' by Moloh. Below we can see just a glimpse of the coat. Many will recall Kate first wore the piece during the Cambridges' visit to Scotland in April. The £425 100% wool garment features two side pockets, double back vent and is fully lined. The blue and grey tartan print works very well together. At the moment, the coat is only available in a size 6. Kate's black hat appears to be the 'Fairy Take' style by James Lock. The hat originally retailed at £285 and came in eight different colours. Below we see the Duchess wearing the hat in 2012, during a visit to De Montfort University with the Queen, she teamed it with a teal L.K. Bennett outfit on that occasion. 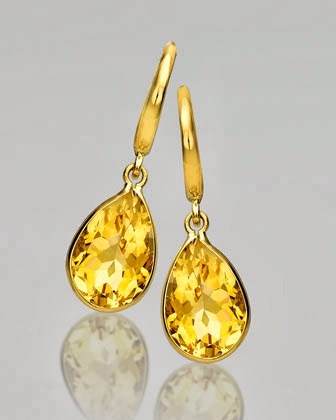 Kate accessorised with her Kiki McDonough citrine drops. I expect Kate completed the look with tights and her trusty Aquatalia Rhumba boots. It was lovely to see the royals today. I'm hoping we'll hear an engagement announcement or two during the week! Great post! I've been checking back here religiously when you stated in your last post that it was possible that William and Kate would attend church. Yay, I'm so happy another Kate sighting. She looks lovely as always. 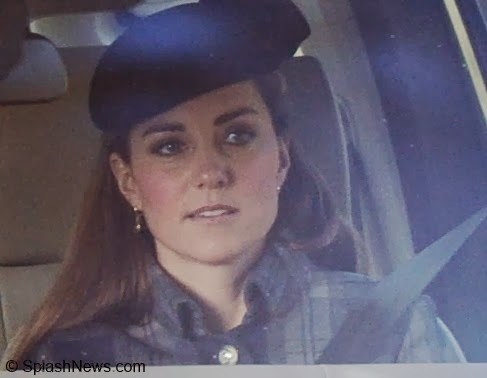 In the first of the photos where Catherine is looking at the back seat, there appears to be another adult their--seems like an ear and perhaps a scarf. Maybe it's the nanny. Thought we might get some photos of them going to church. Great post. Best and fastest off the blocks. Thank you so much. I think that in the picture where Catherine is turning round, she is talking to the passenger in the back - possibly Missy, the wife of Tom van S who are visiting at the moment. If George was in the vehicle, I think Catherine would be beside him. I think the coat looks amazing on HRH- and she's young, she should not dress like an older person. If the coat was inapropriate the first time, she wouldn't have been able to wear a second time. But since she is, its obviously been approved. and looks awesome on her. I have to respectfully agree with Sarah D on this one. I absolutely adore Kate and admire her style but I do feel as if at times her hemlines are too short for someone her age. Such as the coat at the Chentelham. I'm not saying the coat wasn't appropriate for church, it's just that for someone who is 5'10 when you wear skirts or dresses it's already going to look shorter on you versus a short person and when you add an extra couple of inches in heels it will look even shorter. I'm 5'10 also and my body type is exactly like Kate's so I always have to check and make for sure my hemlines are appropriate and I'm 22. For someone who is shorter it's not going to be as much of a problem. You can't possibly believe the queen goes through every royal's outfit at every appearance to see who needs a personal talking to. That sounds ridiculous. Just say you think the hemline is fine without trying to put words into a stranger's mouth and make up assumptions on no basis. Anonymous 5:32: People make assumptions every day on this site. You just don't happen to like this one. I like the coat, but I agree with the original poster that it's too short. Age has nothing to do with it; I'm older than Kate and I wear short hemlines all the time. I don't believe HM can be bothered with going through every royal's outfit, however, I am sure if she heard or saw something and didn't 'appreciate it' it would get back to the person in question. Kate is amazing, I hope we see more of her and William in the months ahead. She can wear anything-tall, thin and so pretty. Anon.5:32 I'm thinking also that the Queen seems very happy with Kate and her hem line is the least of lifes problems. Personally I prefer a longer look but oh well. I think the coat is too short for the working wardrobe of anybody over 21 and looks a little juvenile (wore something similar at age 6); but "The Palace" obviously feels that the positive impact the Duchess has on the royal family outweighs raised eyebrows about her wardrobe. The Queen seems delighted with her lovely grand-daughter by marriage: who am I to disagree? Lovely post, as always. Looking forward to christening photos next. I disliked the coat when Kate was pregnant because princess lines just do not flatter baby bumps, especially when viewed in profile. I'm sure that the coat looked great with her post-pregnancy flat tummy--and the hemline would no longer be "hiked up" in front either--so it would look a bit longer and more graceful. I always thought the tartan weave was beautiful--and so perfect for Balmoral! Excellent point, I do believe it could well be Lady Melissa in the back. Thank you. The photos were taken on the same day, sometimes photographers upload certain photos to various agencies and perhaps the DM were not interested because Kate's face isn't visible? or the photographer didn't think they would be of interest? Maybe the Cambridges are staying at Balmoral until their apartment in London is finished. Can't imagine there is much room for the three of them and the nanny in that little cottage on the property at Kensington Place. It was great to see pictures of the Royals today. Thanks Charlotte, you really do an amazing job of keeping us up to date. What a nice treat to have a new post today! Thanks so much Charlotte. :o) I so appreciate not only your great Kate news, but also the wonderful historical info that you include. How lovely that Will & Kate were able to worship together and can spend time with family before what promises to be a hectic fall. The duchess is such an amazing person to look up to. Family oriented, church goer, health and fitness advocate, charity patron, fashion icon, and down to earth wife and mother. I'm so proud to call her my role model. The engagement was only confirmed for Prince William. In the past, Kate's engagements were almost always announced two weeks in advance, I expect they'll be announced with shorter notice now. Charlotte, that makes total sense to have shorter notice about Kate's engagements now. With baby George around, all plans must be more flexible. It's got to be tricky to figure this all out. Glad I don't have the job, lol. Fantastic post dear Charlotte! You made my day! And I'm so glad to see Mr Middleton's photo behind the New Zealand Prime Minister. Obviously not only does this "controversial" photo get Her Majesty's approval but it also prove her love for her grand son's little family. I wonder if William and Kate possibly timed the visit to meet the Prime Minister to discuss their reported tour next year. Interesting observation, Charlotte. I didn't even think of that. Well done Charlotte , I love it that they can all spend time together , for the most part out of the lens. My men are gearing up for deer hunting so , I hope all of the Royal family had a good time. Grouse sounds better to me than venison. Certainly they had a lovely meal afterwards. I noticed the Corgie beds in the Queen's sittting room. Very cute :) also , the little stuffed animal (corgie ) on the desk. I'm wondering who gave her that. Perhaps a family member. Everything in that room speaks memories and family. Really isn't that what it's all about, no matter what country you are from. The church is everything I would hope for in a small Scotish town, village, hamlet or what ever you call it. On top of that the Queen still makes it a point of going to church!........... yep I'm not going to read into that and neither should anyone else. I seriously think her faith has sustained her. I do hope they were able to go fishing and have a BBQ at the river. I hope Kate is able to relax around the Queen. I would be a nervous wreck. Well enjoy the new week everyone! Thank you Charlotte for the lovely post. Sending Robin my deepest sympathy and love on the loss of her mother. Bless you . Sarah- AMEN to your remarks about our friend Robin. She has been through alot these past weeks. I know we are all with her. Charlotte, Robin is also a big fan of your blog and she lost her mother Thursady. So we have all came together to help her through her loss. This was a nice surprise to see William & Kate together going to church. And how nice for him to be able to drive his wife to church. She is just glowing and so is William. Thanks again for all your time bring this blog to us. AAh so cute to see Queenie driving!! And Kate looks pretty as always. This is kind of unrelated, Charlotte, but do you know of any good drop pearls that are Kate-worthy without being thousands of pounds? Something like the Anoushka pearl shape but with the diamonds?? I am watching Downton as we speak, but I won't say another word as most of our readers are from the US! I do so miss Matthew's character, what a pity the actor insisted on leaving. It was the central love story of the show. Oooh yes I just went onto her website, and the Claudia pearls are very elegant, very downton-chic!! And THX A MILLION for keeping mum about the plot, I am dying of jealousy!!! I would like to hop a flight over to you now to catch Downton! A tad bit jealous that we have to wait another 3 1/2 months. Ugh! Hope it was wonderful! I agree that this visit may have been timed to meet the New Zealand prime minister with regards to the tour. Balmoral is certainly charming and informal with the dog beds and mix of tartan and chintz. Very warm and comfortable looking. Don't know that displaying the photo means the queen loves it but it certainly a very kind and tactful thing to do. And if she has private ones of her own, she may not want to show them off to the public, preferring to display one which has already been released at a time when interest is so high. Who knows what she has in her private rooms. Lovely to see the queen and duke out driving. They are both remarkable. Agree that that coat is too short for church by most people's standards. But we don't know whether Kate wore something underneath it. 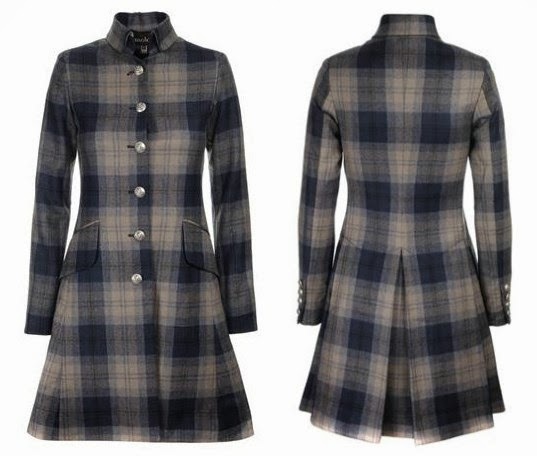 I love the tartan and it would look fantastic with a black skirt or trousers. Kate is young but as a thirty-two year old professional she isn't that young and some of her skirts during pregnancy were too short (and not all that becoming either.) Before she was pregnant, her skirt length was almost always perfect. Don't think the Daily Mail got those pictures since it said that Kate hadn't been sighted. They print a lot of photos if they have them. 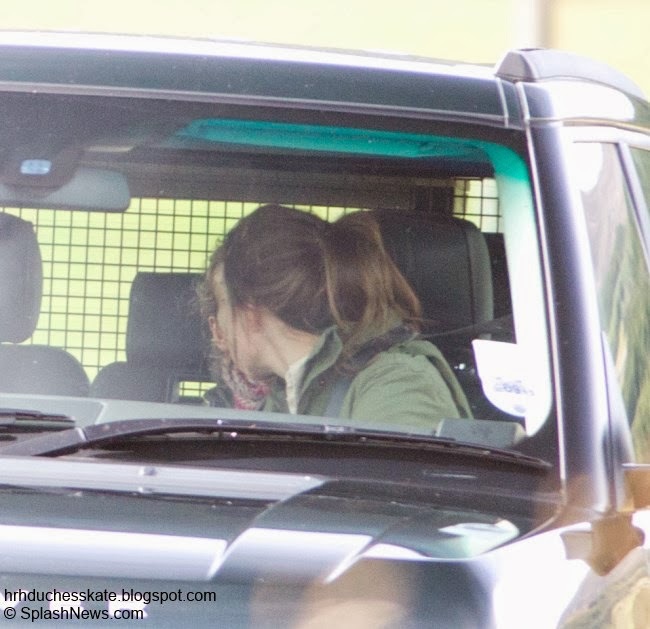 Seems likely Kate was talking to a friend although it could be a nanny. Maybe the queen is giving her seal of approval of the offical pic of Kate, Will and baby G. If she approves the pic, maybe she is telling people or haters to back off. Also, did I spot some nice dog beds for the corgis on the right side of the Prime Minister in the photo? It's nice to get a glimpse into the sitting room to see where the royals spend their family time. Balmoral Castle seems like a beautiful retreat for the BRF and I love the photo of Crathie Kirk. I loved the normality of the sitting room. There's a sense of informality in Balmoral, it provides a retreat from it all for the Queen and Prince Philip. I believe the Queen does indeed have a licence, I seem to remember reading it was kept by her driving instructor after the war and was recently sold to a museum. Even more interesting news about the license! Very interesting. Thanks again, Charlotte! Crathie Kirk is, indeed, amazing. I am so enamored of the "zillions" of breathtakingly beautiful little stone churches tucked away around every twist and turn throughout the British Isles. I hope that my British friends fully appreciate these extraordinary historic, esthetic treasures. What a heritage! I am a patriotic US citizen--but we just have nothing to compare to the British churches. I'd love to plan a tour that concentrated on nothing else but them! Does anyone know of one? I don't usually take tours, preferring to range around on my own, but so many of the churches are, no doubt, in remote sites. I have just "happened up" on tons of them by accident. What a wonderful post! It's so nice to see the royal family out doing things together like any other family! And the room where the Queen met the PM looks like it's very cozy and comfortable,I was rather surprised that it wasn't more posh and regal looking. I wonder what the Queen thought about Kate wearing this dress to church, as I recall it was rather short. Maybe since she's had the baby it fits differently, maybe a little longer? As always though it's great to see Kate and William spending some time together looking so happy and contented with life! Charlotte thanks for another great post!. 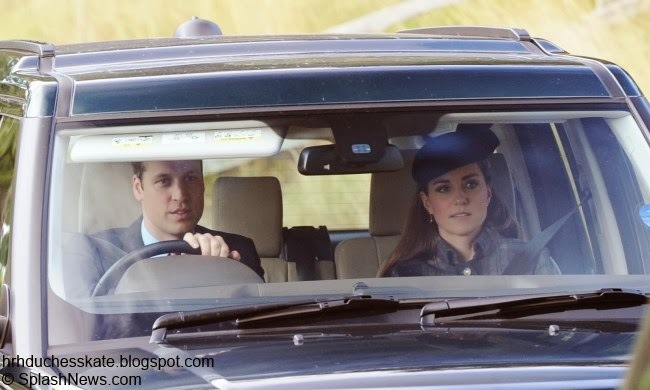 I think William and Kate look so cute together driving in the car to church. I am glad they get to spend this relaxing time with William's side of the family. I love Kate's hat always have and those citrine earrings. Nice charlotte wonderful post i hope the duchess enjoying and had time to relax in scotland i think the queen considering that outfit hers ..
What a wonderful surprise to have a new post! William and Kate looked very happy and relaxed from their week. I hope they had a lovely time with family and friends. My first thought when I saw Thomas riding with William was if they invited him and Melissa to ask if Thomas would be a godparent to Prince George. Guess we'll be finding out soon. They looked so cheerful riding to church. I'm glad they had the time together and I know the Queen was happy to have them. Kate's dress is not one of my favorite she has ever worn, but she still looked lovely (what we can see of her). Again, glad they had the time in Scotland. Great to see the Queen with the PM in the sitting room. It looks cozy and warm. Can anyone tell what the Queen is doing? Loved the dog beds! SO cute! Thanks for the update! Charlotte, any idea when Will and Kate are definitely moving int 1A? 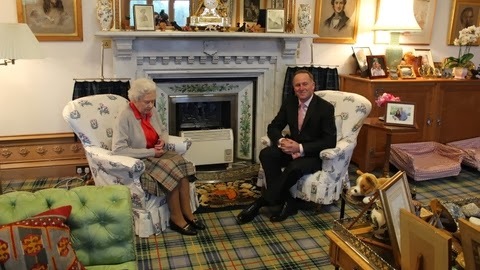 Did anyone else think the plaid of the Queen's skirt was remarkably close to that of the carpeting in her study? They're not quite the same. The Queen's skirt is the Balmoral tartan (designed by Prince Albert, it is only worn by select members of the RF), and I think the carpet is a variant of Stewart tartan (it might be Stewart Victoria, as that's what all the furnishings at Balmoral originally were). I thought you and your readers may be interested in this article; it explains how the Slovenian Ambassador and his wife reached out to EACH and presented them with a beautiful birch cradle. Imagine packing for a holiday and having to include clothes suitable for church and doubtless gowns for dinner at Balmoral, besides all the stuff needed whenever travelling with a baby. No wonder they had a private plane! We don't know what she wore the coat with, but even if it was the tights and boots she wore before, I didn't think it too short and as she is no longer pregnant it possibly looks longer now. Jean do you think they do gowns still for dinner or have perhaps relaxed things a bit? I'm thinking at Balmoral things are more relaxed. Suppose it depends on who is coming to dinner---though I think in recent years the Queen is more likely to have the guests for lunch than for dinner. Of course we don't know whether they are still at the Castle or with the Prince of Wales at Birkhall or even at the cottage on the estate which the 2 Princes shared. Gosh, it's nice to be back :) In the beggining of September, I spent a week on vacation in Brazil (wich was TERRIFIC), and spent the following week in the Algarve, and now I've been completely busy with work. But there's always time to my favourite blog! I've been in Scotland myself, no long ago, and I absolutely LOVED it. From Edinburgh all the way up to Loch Ness, from the Highlands to Glasgow, I adore Scotland, its history, castles and traditions with all my heart. It was certainly one of the most special places I've ever been. Shame on me I didn't visit St. Andrews and the East Coast, where our Duchess went to college, but one day I will. Hugs, and I wish an excellent week to you all! What a nice read! Everybody looks to be relaxed and enjoying themselves. Kate looks very radiant; I hope this is an indication that she is getting more sleep now that baby George is getting a bit older. It was good to see William and Kate together. These nice little holidays are perhaps a good mood boost for everyone. Also good to see that Lady Melissa and husband were able to join them there. Charlotte, has there been any official announcement regarding Godparents yet? i would lovvvvveee the coat if it was jjust two inches llonger also totally random but when prince William mentioned in his recent interview the spotlight isn't where he likes being..and we hear that solo much from him..why doesn't he renounce his rights? He could still talk to his family I'm sure I just think he wouldn't because he honestly couldn't live without the enomoruous wealth and privilege he has plus i hate when he says they want to be normal..then why have a monarchy if u want to be normal? psI'd trade places with him in a second . Prince William has a huge trust fund from Diana, if he walks away, they will want for nothing. I wish that he would or could, I don't think he can or will. Anon.5:38 personally I think there is a huge difference in not enjoying the spot light and abdication. I think it comes down to responsibility , being a caretaker of a trust you have been given by birth. At this point the British people seem pretty happy with Will and Kate. Sure they could walk away and be financially very comfortable but what about Character and Loyalty? Kate looks great. As always, sooo, so much prettier with her hair pulled back :) She has such a pretty face. I'm sad to think the picture of the queen with P. Charles, P. William and baby George will not be made public. I think it would be a lovely gesture,but also quite unlikely. How far in advance is a christening announced? When are they permanently moving to Kensington Palace? If I were the mother, I would be anxious to see the nursery finished. I'm thinking with them in a temporary house + the Middleton mansion + now Balmoral, perhaps the official/first nursery is not yet completed and will be until their permanent home is ready for them. William and Kate are moving in to KP over the next few weeks and the christening should be taking place in October, I imagine there will be plenty of notice. It will be a fantastic day for the royal family. I'm very excited about next years tour of Australia/New Zealand, I think it will be excellent to follow.